A 1928-29 Ford that ran in the mid 150 mph range. I shot this with a full frame equivalent focal length of 840mm. It was one of my few successful shots at that length, mainly because things are very hard to spot when they are moving fast, pretty far away, with heat waves coming up off the salt and with a very narrow angle of view. I have since bought a device to help with that. Great shot, Dan! Great constrasting yellow against the white salt. VT!!!!! This came out well! V So what is the device? Good work...I imagine it was. Excellent shot at 840 mm Dan. 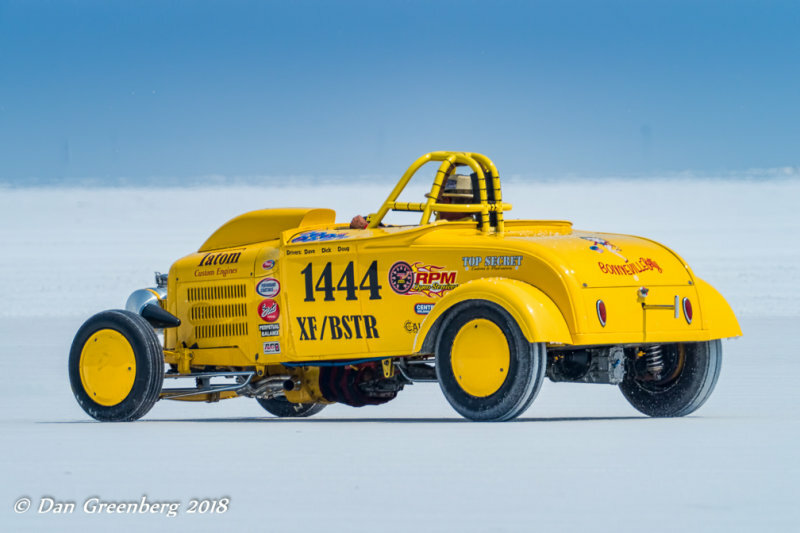 Great capture of this brilliant yellow car, which looks great against the white of the salt flats. V.
Looks a mean machine in brilliant yellow.